You’re in for a challenge today! Don’t worry, you can do it. 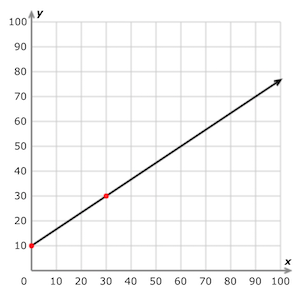 You can measure x and y from the reference lines called the x-axis and y-axis. Now tell me, what is the slope of the graph? The variables x and y represent two quantities that have a linear relationship. 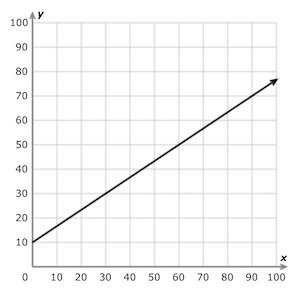 The slope of the graph is a ratio between the change in y and the change in x. That means we need to pick two points on the line and compare the change. Two points on the line are (0, 10) and (30, 30). Put those points into the slope formula. 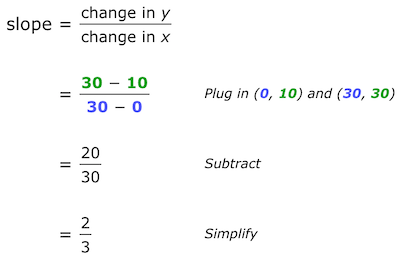 On the graph above, y changes in a two-thirds proportion to changes in x. Since this is a linear relationship, the slope represents a constant rate of change. Are you scratching your head? Try picking two other points for practice. Today’s lesson is one of many pre-algebra skills needed for high school and beyond. If you have questions, you can find the answers to your questions. You can learn anything. Tutors help you learn.